Want cool and easy—and creamy and luscious, too? 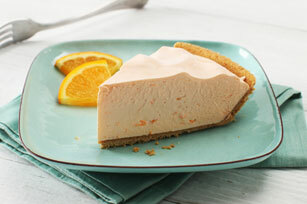 This no-bake refrigerator pie fits the bill with its blend of COOL WHIP and orange JELL-O. Add boiling water to jelly powder in large bowl; stir 2 min. until completely dissolved. Add enough ice to cold water to measure 1 cup. Add to jelly; stir until slightly thickened. Remove any unmelted ice. Whisk in Cool Whip until blended. Refrigerate 15 to 20 min. or until mixture is thick enough to mound. Stir in zest. Spoon Cool Whip into slightly thickened jelly, using the amount of Cool Whip specified in the recipe. Gently stir the Cool Whip into the jelly until all the Cool Whip has been incorporated and mixture is a uniform pastel colour. Use this method in any recipe that calls for folding or gently stirring one ingredient into another.